Featuring writing, interviews and original art work – reproduced in full-colour – by internationally renowned academics, curators, activists, filmmakers and artists, Dissonant Archives: Contemporary Visual Culture and Contested Narratives in the Middle East asks a crucial series of questions: How do we define the ongoing relationship between contemporary art and the archive? How do we understand the suppositional forms of knowledge that are being produced in contemporary art practices in North Africa and the Middle East? Do these practices foster a nostalgic fetishization for the archive or suggest an ongoing crisis in institutional and state-ordained archiving? And what, moreover, do artistic practices that engage with archives reveal about the politics of global cultural production? Emerging throughout this volume as a troubled, dissonant and performative space, the archive is central to a process whereby contemporary artists produce their own critical and highly speculative visions of the future. In exploring and producing archives, be they alternative, interrogative, or fictional, these artists are not simply questioning the authenticity, authority or authorship of the archive; rather, they are unlocking its regenerative, radical potential. Basel Abbas and Ruanne Abou-Rahme, Lawrence Abu Hamdan, John Akomfrah, Jananne Al-Ani, Meriç Algün Ringborg, Héla Ammar, Burak Arıkan, Ariella Azoulay, Vahap Avşar, Sussan Babaie, Alessandro Balteo Yazbeck, Timothy P.A Cooper, Joshua Craze, Laura Cugusi, Ania Dabrowska, Nick Denes, Chad Elias, Media Farzin, Mariam Ghani, Gulf Labor, Tom Holert, Adelita Husni-Bey, Maryam Jafri, Guy Mannes-Abbott, Amina Menia, Shaheen Merali, Naeem Mohaiemen, Mariam Motamedi Fraser, Pad.ma, Lucie Ryzova, Lucien Samaha, Rona Sela and Laila Shereen Sakr (VJ Um Amel). 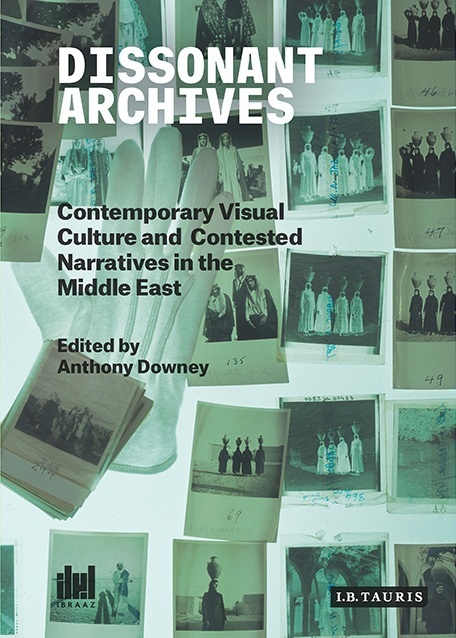 Dissonant Archives: Contemporary Visual Culture and Contested Narratives in the Middle East launches on 30 May 2015 at JAOU Tunis 2015 at the National Museum of Bardo, Tunis. To purchase a copy of Dissonant Archives please follow this link.